This is a light and economic menu. Orders MUST be done online, and can be picked up directly from the restaurant or at our designated locations at the specified times. Order confirmation and invoice will be sent by email. Order pickup reminder will be sent by text message in advance. Orders must be picked up on time. There are no refunds for missed pick up times. Orders can be cancelled before the cut off time and are only refundable through credit money. Tips for service and delivery are mandatory and non-negotiable. Credit money will be applied in priority. The remaining balance will apply to your credit card. Credit money can purchase from the delivery person or restaurant directly by cash. Credit money is non-refundable and can be used for restaurant dining with restaurant manager’s approval. Takeout / Delivery Online Order will be ready soon. 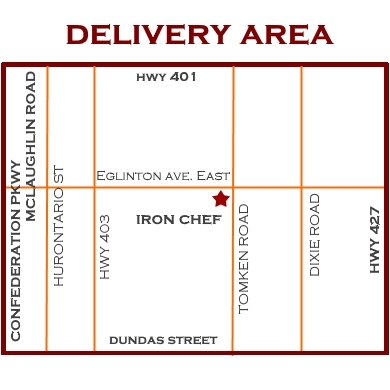 Orders can be pick up from the restaurant or delivered to your location. $3 delivery fee will be charged for order under $50 before tax.